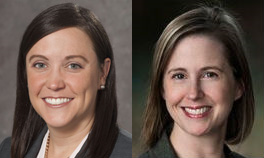 STSA congratulates members, Lisa M. Brown, MD, and Lauren C. Kane, MD on receiving 2017 TSF/WTS Carolyn E. Reed Traveling Fellowship Awards. This Fellowship was established by Women in Thoracic Surgery and the Thoracic Surgery Foundation in 2013 in memory of Carolyn E. Reed, MD. Dr. Reed served as STSA Secretary/Treasurer from 1999-2002. She was elected the first woman STSA President in November 2006, and her Presidential year concluded at the STSA 54th Annual Meeting in Bonita Springs, FL in November 2007. Dr. Reed was a successful thoracic surgeon, researcher, and educator; she was a beloved member of STSA and played an integral role in propagating the Southern Thoracic and the specialty throughout her career. Dr. Reed passed away in November 2012. 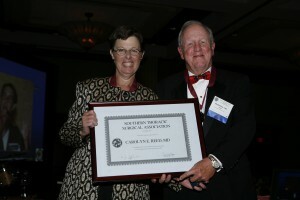 John Hammon, MD (STSA Past President, 2007-08) presented Carolyn Reed, MD with her STSA Presidential plaque in November 2007 at the STSA 54th Annual Meeting. The TSF/WTS Carolyn Reed Traveling Fellowship funds a clinically established woman thoracic surgeon to travel to another institution for the purpose of learning a new skill or technology. With a burgeoning field of surgical technology, many surgeons seek an opportunity to gain new experiences and return home with innovations and collaborations. As she was the consummate educator, the leaders of both WTS and TSF deemed it most appropriate to establish this initiative in honor of Dr. Reed. Dr. Lisa M. Brown received funding for her project titled “University of Michigan Health Services Research Traveling Fellowship” in the amount of $10,000. Dr. Lauren C. Kane received funding for her project titled “Learning Surgical Strategies with Later Presenting Congenital Heart Disease in India and Beyond” in the amount of $10,000. Click here to view additional information about TSF awards programs and recipients.